Returning to Greenock following another cruise on the Clyde, the preserved paddle steamer WAVERLEY was seen speeding across the Clyde on Thursday evening with the Arran hills in the background. At her bow, she is flying the White Horse flag of Invicta, the banner of Kent, representing the area in which her current master resides. Over the years there has been considerable debate about which flag should be displayed at her stem, with the Scottish saltire, Welsh dragon, and British Pilot Jack all having appeared recently. 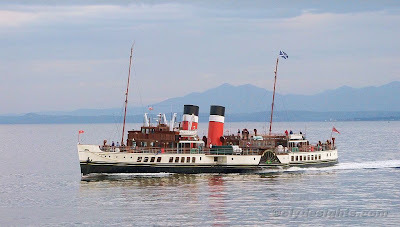 Great picture of the majestic Waverley.